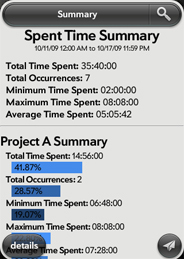 Time Spent is perfect for contractors, managers, trainers or anyone interested in keeping track of how much time they spend on projects, tasks, clients, habits or any other activity. 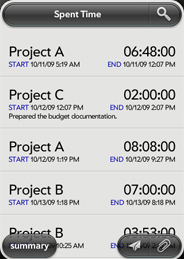 It allows you to track multiple projects simultaneously with customized reminders to keep you on task and your time accurate. 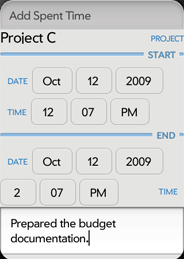 Summary, detailed and CSV reports by date/time range and project(s) can be generated and emailed. 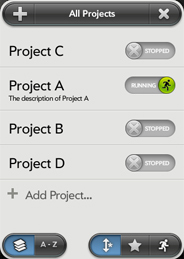 Filtering, sorting, favorites and running views help you find projects quickly. 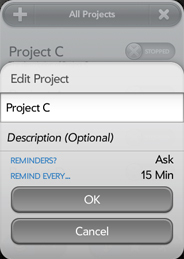 Time spent on a project can be manually entered, edited or deleted. 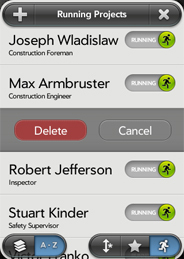 The ability to efficiently remove unwanted and old records is available in a convenient Cleanup feature. 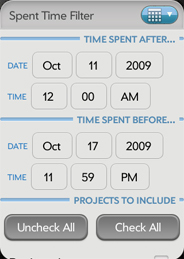 Time Spent is available for WebOS devices. 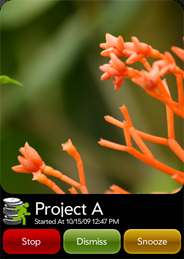 For more information on WebOS,please visit Palm. © OrgOrganization. All rights reserved.